Discussion in 'Gran Turismo Sport' started by GTPNewsWire, Apr 2, 2019. 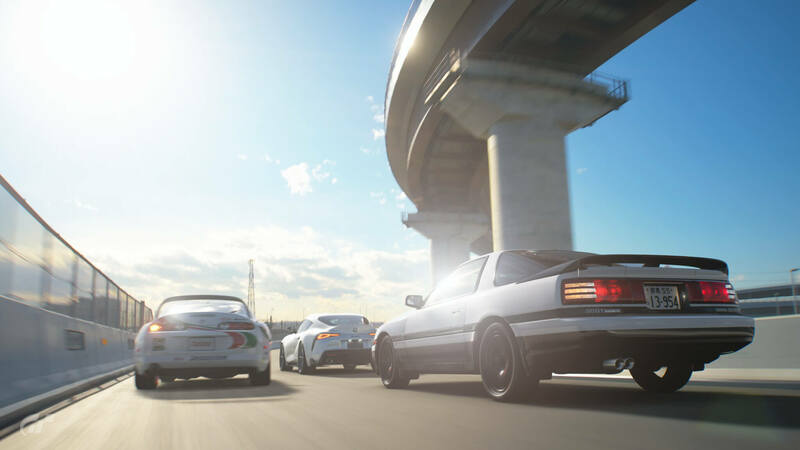 This article was published by Andrew Evans (@Famine) on April 2nd, 2019 in the Gran Turismo Sport category. im_seb30, IngRobNy, Dotini and 11 others like this. Great, the next title is shaping up to be one of the most impressive one! im_seb30, XRaider, Auto motors and 7 others like this. Hell yeah. I wish I could relive the magic that was GT5. Hopefully with a full-blown GT7 on PS5 this will become a reality. fortbo, im_seb30, willbegone and 5 others like this. Interstellar9, Inferno251, AlexDB9 and 9 others like this. im_seb30, IngRobNy, xxy98cn and 14 others like this. HarVee, Flash_Sweden, willbegone and 4 others like this. I think they are realizing there's a ton of people, myself included, that just don't care about Sport Mode, and really don't care about FIA races. I'm not an alien driver, nor do I care to be. I just want to have fun playing a game, not get a job in racing. Wayne Gratiot, Chubbymudkip, HarVee and 50 others like this. New game won´t be before 2024 I guess. And I hope it is a full game on release with real tracks. courageC60, JayRS200, willbegone and 2 others like this. May I say, as no doubt has been commented upon numerous times, there is too much of a grind in uninteresting AI modes to earn enough credits to acquire the most desirable cars. If you have bought the game, why should these cars be placed so far beyond many players' reach? I think that some sort of divisional levels would increase interest in the FIA Championship, with titles for less able players. You could perhaps get promoted or relegated, as with football, depending upon your results, with divisional winners. At the moment, all players compete for the one title and it is obvious to perhaps 99%, that they cannot win and therefore have little incentive to compete ie ME! DGXR, HERE4BEER3, palqo and 17 others like this. I do miss quite a lot of the features from past GT games, and while I do appreciate all of the new features in Sport, it's missing that one thing that made older games special. Manasseh257NSX, palqo and PirovacBoy like this. PD have made many improvements these past 18 months. For all the complaints about single-player content, the license tests where the most enjoyable in any GT. We just need many more of them. More events, more diversity, greater rewards. Make better use of those Gr.X cars with more single-player events. Also allow us to toggle AI difficulty without relying on rubber-banding. There’s the odd challenging event, but many you can cruise through, without thinking twice about best lines etc. Would also love some true endurance races, 6hr, 12hr, 24hr with huge credit/car rewards. For example, maybe allow us to pick any individual car over 10m credits. Obviously they should allow us to pit and save the game too. This too. Tuning and modifying cars is a huge deal for me. I would think this mode would need to be separate from Sport mode given BoP difficulties. Manasseh257NSX, chrisspeed281, im_seb30 and 7 others like this. Well duh, the game series has been focusing solely on single player content all the way up to it's fourth main title, breaching into non-commitment multi-player mode with the fifth and sixth title but while still maintaining the focus on single player content...It wouldn't be different with this game, even though it was advertised as a game with focus on e-sports. I'm expecting that GT7 will have the most lengthy and impressive career mode to date. Skyline_R34, AlanH49 and TokoTurismo like this. Yes! I like the sound of that! It's definitely sounding more and more like the next GT is going to be GT7, which is what I'm waiting for since I don't care about Sport Mode (nor am I a fan of it). Also, the events NEED to have obtainable cars as well? In GT Sport there is no motivation for me to actually complete them like in the old GTs, so hopefully they change it to that again. Hearing this news is making me excited. OlegMarkaryan, chrisspeed281, willbegone and 3 others like this. I don't think there are tons of people finding the AI challenging... I have 0 motivation for finishing the GT league because it's too easy, it's boring, and there are no rewards. Since it's basically impossible to make a racing AI of different levels that behaves "humanely", they should just find a way to make people behave correctly and give rewards to satisfy slow people. I mean increasing the number of DR categories, investing time in improving the penalty system, and making the driving school mandatory would fix the problems for most users that hate the sport mode. drummingcat, Inferno251, jjaisli and 2 others like this. HarVee, OlegMarkaryan, klondike and 8 others like this. HarVee, palqo, Inferno251 and 5 others like this. One of the things that pushed me to improve in previous games was the difficulty of getting a gold in the license tests. steve nfs, Muller_cj, Lazybike and 12 others like this. Only offline stuff I'm interested in is more missions. i want an option for a grid customisation off line for custom races . Manasseh257NSX, VFOURMAX1, Inferno251 and 6 others like this. pls fix the clutch bug. wozman70, jjaisli and VBR like this. Not sure why you quoted me, nothing I said has anything to do with what you said. This is going to be an unpopular opinion with many here that long for the nostalgic days of past GT titles. I think the series has been losing it's luster for the past few titles (but more specifically GT6) with the same rinse-and-repeat GT offline campaign mode, featuring dumb, "on-rails", stone age AI that includes a ridiculous grind to unlock an endless supply of car variants (20 different evos and skylines) with next to no customization. There was no other incentive to play the campaign mode other than unlocking cars; the incentive to play the game certainly wasn't in racing the AI. The typical GT campaign mode model was fun and acceptable back in the PS1, PS2, and to a certain extent PS3 days, but the series needed to make a shift to something more. And I think that something more is GT Sport. There is no substitute to racing another human being with similar skill-set. GT Sport gets a lot of flack for it's penalty system and online gameplay, but the quality of racing to be had online is astounding for a casual console racing game for people who are willing to put the time into getting better at the game. It is just too resource intensive to program an algorithm or AI capable of replicating human behavior, all other racing games with AI suffer from the same thing (too fast in some corners, too slow in others, too predictable, not aggressive enough, too aggressive, etc...). I really think that PD should continue to support GT Sport and attempt to adopt a games-as-a-service model, similarly to what has been adopted with other games in the spotlight right now. PD should keep building on the solid foundation that they've built so far, and not abandon it for another title where they are likely to encounter the same pitfalls in early development of GT Sport. The old model of continuing to pump out a new game every 2 or 3 years (5 years in the case of GT...) is outdated and developers have learned that updating and supporting existing games is the better approach from a time management and efficiency standpoint. PD should keep refining the penalty system in GT Sport, keep refining car classes, keep refining the DR/SR system, keep adding cars and tracks, add perhaps some offline "etiquette" driving classes to incite offline people to race online and in a civil manner, and so and on, and so on... The possibilities of GT Sport are endless, and I believe it's the future of racing games. NevilleNobody, Darwock, The Chosen One and 8 others like this. Yamauchi revealed that the game had seen some 3.5 million players participating in “casual” lobby races. The official Daily Races accounted for around 1.5 million players, but the flagship FIA Championship events numbered only 358,000. I appreciate PD acknowledging improvements, but really disappointed to continue to hear vague comments that do not illustrate how GTS will evolve. Did they not understand that their initial 1.5 yr focus on elite FIA championships would naturally narrow the field of participants? And given this franchise's history with solo play, it was a critical gamble that may stumble to gain traction? Seems PD is finally looking at the participation numbers and ready to think about how to address the lack of bottom up participation - those casual players that are at the heart of this franchise. Like so many have already stated, there are plenty of low hanging fruit for PD to implement, but please do not just replicate the past (like the dismal GT League). No one desires to go back to GT6 gameplay...GTS could be an innovative evolution to solo play from past, with a credible integration with eSports - a destination for novices to begin their driver progression and a world stage for elites to shine on the limit. Inferno251, Clean Racer and potvinsuks like this. I wouldn't mind if there were a 1000 license tests, or Driving Missions! I don't care what you think but I love them! Petroperu, OlegMarkaryan, Inferno251 and 3 others like this. But please improve the AI this time. I want more competitive and real racing. VFOURMAX1, jyri, Inferno251 and 8 others like this. What i think they should do is to make things less of a "list" to checkmarks things out and really utilize a lot of the online\real driving experience to integrate in offline. GT Sport's Driving School has potential but ends up being more of a list to do since everything is easy and frankly didn't really help me in too much since i could do some big mistakes and still get gold (i still appreciate lessons about a front wheel car understeering etc). In the end i enjoy when races are thematic or when you want to beat a time that seems hard but with practice it'll become standard or even better. .
GT4 Driving missions were a mix of hard and with a theme into it, they were quite fun. GT5's special events were interesting and some hard which in the end you'd learn something. GT6 time rally was something honestly and while i hated the AI with a burning passion, it reminds me those old school games with checkpoints. GT Sport has barely few time rallies and they're too easy lol. Inferno251, ddm, MMX and 1 other person like this. XRaider, Inferno251 and evldave333 like this. GT League gets very boring with no prize cars. Missions and License challenges are the most fun. Why not nore Time Rally and Coffee Breaks, there's always a shortage of them! Petroperu, OlegMarkaryan, Manasseh257NSX and 5 others like this.